3 3/4-inch Hasbro Star Wars action figures return with The Black Series bringing you characters from the entire Star Wars saga! Each Action Figure comes with awesome accessories. Exciting black series Star Wars packaging showcases the figure! Case includes 12 Star Wars heroes and villains! 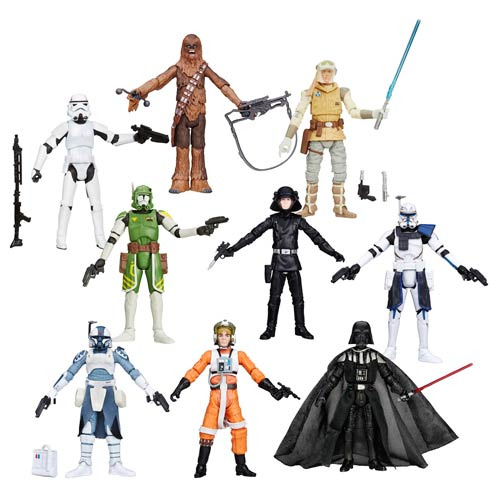 These 3 3/4-inch scale Star Wars action figures feature heroes and villains from across the galaxy! Longtime fans of Star Wars are going to love the great style, bringing returning favorites with new style like you've never seen before. Each Star Wars Black Series Action Figure comes individually packaged with terrific accessories like blasters, lightsabers, and removable helmets. Don't miss this awesome assortment of Star Wars heroes, villains, and more! Ages 4 and up. Please note that this case originally included a Princess Leia figure. The manufacturer has informed us this figure will not be available in this assortment.